The purpose of the ColdSIGHT™ system is to track sample boxes in ultra-low temperature (ULT) freezers. ColdSIGHT™ is designed for -80 ºC freezers that contain racks placed on shelves which in turn hold boxes of samples. Automatic Inventory – ColdSIGHT™ is capable of providing the ID and location of every box in the freezer. This inventory can be generated upon request, at set times or triggered by an event such as a door close. 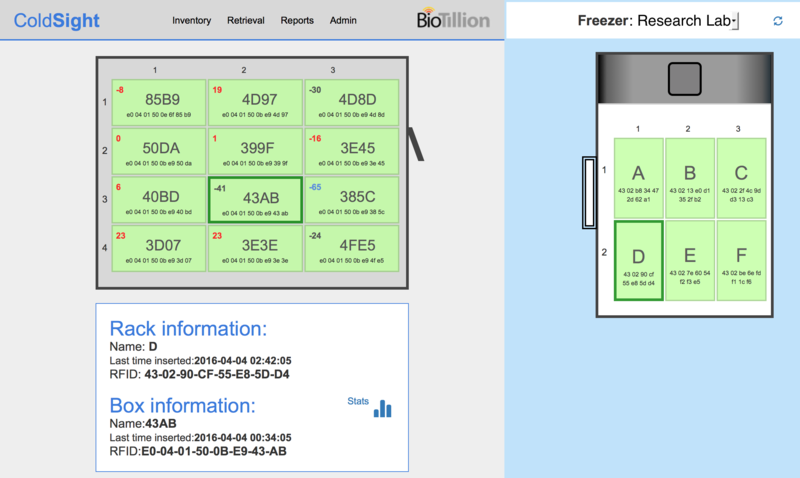 Since the full inventory of the freezer is always known, ColdSIGHT™ is capable of answering questions such as “what are the contents of rack 1772A3?” or “where is box 2E972D?”, etc. Autonomous monitoring and Audit Trail – ColdSIGHT™ can detect and report any change in the freezer inventory. This can include the addition or removal of racks and boxes, door openings, door closings, logging of personnel ID badges used to open the door as well as reporting temperature swings outside predetermined values. 3D temperature mapping – ColdSIGHT™ can sense the temperature at each box location inside the freezer. The temperature can be monitored as often as needed. Temperature reports for each box location can be generated to establish the level of sample integrity. Any deviation from defined protocols can generate alerts. Guided access – ColdSIGHT™ system can guide the user in retrieving or placement of racks and/or box to and from the freezer. A sample “Pick List” can be used to generate visual cues leading the user to the correct box and rack locations. Audible and visual alerts can be generated when the wrong box or rack is pulled inadvertently. The ColdSIGHT™ system will interact with Laboratory Information Management System (LIMS) or Freezer Inventory (FI) software. The precise feature set available in any given installation will also depend on the LIMS or FI implementation. We will be happy to discuss adding support for your specific requirements. The system will be offered either preinstalled or as a retrofit for existing freezers. The number of racks, boxes and samples in the freezer is not reduced when the freezer is ColdSIGHT™ enabled, so a 60,000 sample freezer will still hold 60,000 samples after ColdSIGHT is installed. Preinstalled ColdSIGHT™ systems will be available in collaboration with partner freezer companies. Currently BioTillion is in the process of establishing these partnerships. Retrofitting will be possible for the vast majority of the freezers in the market. A detailed ColdSIGHT™ freezer qualification list will be issued shortly. The retrofit process is intended to be straightforward and reversible. Installation will be performed by qualified field engineers. ColdSIGHT Controller controls the ColdSIGHT and connects via LAN or WiFi to the LIMS or any other management system. ColdSIGHT Shelves are connected to the ColdSIGHT Controller. They will be available in a variety of sizes to fit any freezer on the market. ColdSIGHT Racks interacts wirelessly with the ColdSIGHT Shelves. Rack sizes and formats conform to existing racks. ColdSIGHT Labels will be sold in sets for each box. Each set will have an RFID tagged label and a matching label with 1D and 2D barcodes as well as human readable text for backup. ColdSIGHT Software that interacts with LIMS software. To enable smooth integration, BioTillion offers an SDK with a documented API.